So finally Maria from A Night's Dream of Books and I read chapters finished up this book by reading the last 6 chapters. Well, actually, you know by now that I read ahead and finished this before but so did Maria so it's all good. So here's this week's questions. Once you read them hop over to her blog and see what I asked her. 1.) How did you feel about Chris stopping Starr when she really wanted to make love with him? He said that she was "not in a good place". I feel that it was very thoughtful and considerate of him. It showed me that he truly cared for her and obviously wanted their first experience to be very special. It actually made me love Chris even more and went further to convince me that he is the guy for Starr. 2.) The BIG question! What was your reaction when a radio DJ announced that the grand jury was NOT going to indict Officer Cruise for Khalil's murder? Actually I had dual reactions. First, I was glad the author continued on making this a realistic book and didn't end up doing a "happily ever after" type of finish. Thomas wasn't afraid to continue the controversy and make the book more pertinent to today's news and society. Secondly though, I wasn't surprised at the verdict. We've seen it time and time again right? And honestly, nothing in the news surprises me now. Which is sad. 3.) At the climax of the book, Starr actually becomes an activist. What impact -- if any -- do you think her actions will have on the Khalil murder case? This will probably come across jaded but honestly, I don't think her activism will have any impact on the case. That being said, I do think her activism is a good thing. Starr needed to speak up and fall into this roll to help herself and feel like she was taking steps to make a difference. And honestly, it takes a bunch of individuals working together on anything to make needed changes. So in that aspect, I think what she did was a good thing. Sadly, Starr did what she needed to do and the outcome was still negative. She has to learn to live with that decision and not feel defeated. 4.) I finished the book wanting MORE of these characters and their story. 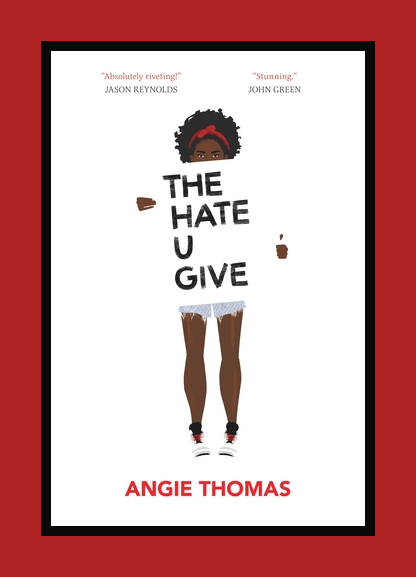 In your opinion, does Angie Thomas most likely feel that the story is complete in this one book? I've heard her new book which just released actually takes place in Garden Heights as well. I don't know if any of the same people end up making appearances but I feel this this tale is complete. I think history as a whole is still being written and I'm not sure when she would take these characters. Although, it would be fun to visit them 10 years from now, when they are adults, and see what they are doing and how Khalil shaped their lives. Would Chris and Starr still be together? Would King still be alive? And what would become of cute yet obnoxious Sekani? 5.) Maria threw in an extra question. How do you feel about the way the book ended? I don't like the ending as far as the verdict or Mav losing the store but I do like how it ended on hope and the family rebuilding and wanting to strengthen the community. I do worry about Devante's outcome because I don't think turning in evidence on King is as easy as it sounded and don't know that it will make his life any safer. I think if King is removed from the picture, maybe Seven can rebuild some sort of relationship with his biological mother which would be good. So there you have it. Next week will be my final review so I've hope you've enjoyed getting a more in depth look at "The Hate U Give." Stay tuned because I think Maria and I may be tackling a fantasy novel sometime down the road. I didn't realize her new book takes place in the same book universe. I am anxious to read her new book. I may see if my library has it soon. I love the way you guys are reading this together. It is like a virtual book club! Glad you enjoyed it Ethan! I totally agree that Chris was very thoughtful in that situation. Yes, he wanted their first time to be special. He is DEFINITELY the right guy for Starr!! GREAT two-part answer on the second question! I totally agree! A "happy ending" type of finish would have made the book have less of an impact on readers. Thomas was, after all, making a strong statement about all the real-life situations in which there has NOT been a "happy ending" for so many blacks killed by white cops.... As for the outcome of this case, I'm not surprised, either. And btw, I don't watch the news anymore. Occasionally I will read an online news article, but that's about it. Again I agree with you, this time on the impact of Starr's actions during the riots. That was a very brave thing for her to do. She could have been arrested. And it was obvious that her actions were not going to have any impact on the outcome of the case. You hit the nail on the head with your answer to question number 5!! Yes, I would also LOVE to see the relationship of Seven with his biological mother go to a better place! Maybe now, without King on the scene, they can actually become closer. But maybe this is just me wishing for a little bit of a "happy ending"....lol. I was also sad that Maverick lost his store, but yes, there was a theme of hope as he and his family began the rebuilding process. And it was SO nice of Mr. Lewis to give them his barbershop space, so they could expand! Thanks for your GREAT answers!! You'll want to check out her new one then. At least the setting will be familiar. So glad you enjoyed this. I think we are tackling fantasy next. I like this form of buddy reading and think it works really well with you both coming up with your own set of questions. I hope your next read works as well. What's Happening...(02/01/19) And a BIG RANT! January 2019 Down for the Count!